From 10/5 ~ 11/3, J-World Tokyo is running a Mukkun and Muro-chin Hallowe’en special festa. 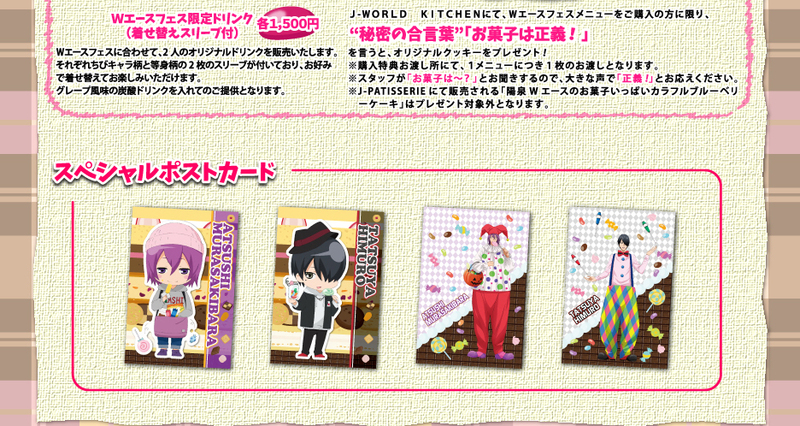 There’s special goods in the store, in the various Kuroko kuji games and kitchen menu items. Purchasing the menu items will get fans special Hallowe’en postcards. In the dining hall, there’s larger than life cutouts, and the sound system plays both short dramas with the two characters and various Granrodeo Kuroko opening songs. Full details can be found on the J-World site. First ticket lottery: Runs 10/13 ~ 11/23. Users who buy and download the full Ultra Souls IOS/Android game pack (parts 1-6) will get a chance to apply for up to 2 tickets. Second ticket lottery: 12/3 ~ 12/25, for fans who buy the blu-ray/dvd of the musical.